The TMM3 Video Fluoroscopy Swallow Study (VFSS) Stretcher-Chair features powered patient positioning designed specifically for performing modified barium swallow studies (MBS). Its 90-degree rotating seat can eliminate transfers by allowing patients to remain in-chair for both Lateral and A/P imaging. Powered back, leg and height adjustments eliminate hydraulic, pneumatic or manual positioning and allow for effortless conversion from chair to stretcher configurations. 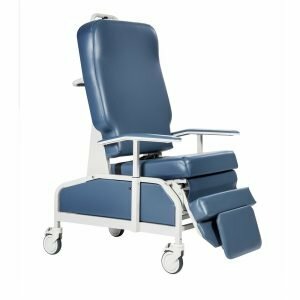 The TMM3 is a procedure chair, transport device and recliner all in one! The TMM4 Multi-Purpose Stretcher-Chair with innovative powered patient positioning reduces the possibility of staff injury, decreases patient fall risk, and improves throughput. The TMM4’s back, leg, and height adjustments enable conversion from chair to stretcher with the push of a button. It’s a transport device, procedure chair, and stretcher all in one! It can be configured for departmental needs through a variety of options and accessories. The TMM5 Mobile Surgical Stretcher-Chair enables facilities to rethink how patients move through the operating room care cycle. 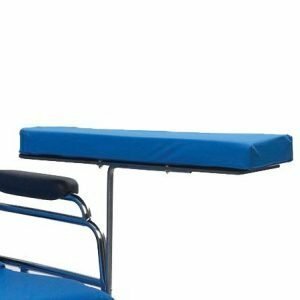 A comprehensive selection of options and accessories along with advanced standard features provide a customizable transport and treatment platform that allows patients to travel from admission to discharge on one piece of equipment. 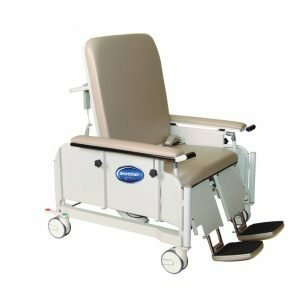 The Stretchair© Series is the perfect solution to help meet the demands of safe patient handling in bariatric patient transport and transfer. This versatile chair offers pendant-controlled powered height and infinite recline to achieve lay-flat positioning. Featuring an impressive 400 lb. weight capacity, all manual controls and the unique ability to convert to a lay-flat configuration, the S400 provides the perfect option for streamlining patient transport and transfer. Utilized for surgical procedures, this optional accessory clips on the surgical rails of our the TMM4 and TMM5 Stretcher-Chairs. Optional accessory for seated position mounts in any of the wells on the seat frame of TMM Series Stretcher-Chairs – can be rotated for desired positioning. 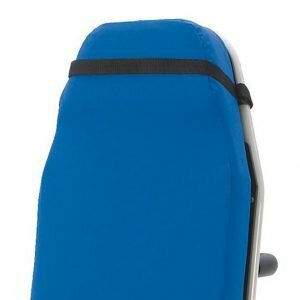 Optional accessory attaches to either surgical rail located on the sides of the back section of TMM4 and TMM5 Stretcher-Chairs when in supine / stretcher position. Pull lever underneath and it articulates from down by patient side to up by their head. The standard pad comes in Black Vinyl. Additional colors are available for an up-charge. Optional locking armboard assembly that locks down on the surgical rail and will not slide on the rail should you need to re-position the TMM Stretcher-Chair. Fits all TMM4 and TMM5 Stretcher-Chairs. This optional back extension for TMM3 Stretcher-Chairs allows the chair to also be utilized for safe patient transport. This optional 1″ nylon head strap is designed to keep the patients head in place during diagnostic procedures. 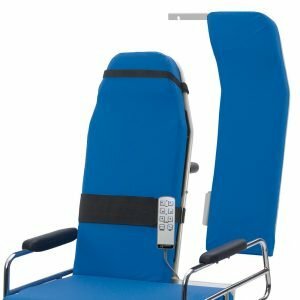 Fits all TMM3 Series Stretcher-Chairs.